Origin and Habitat: Cylindropuntia bigelovii is reported in Mexico from the states of Baja California, Baja California Sur and Sonora. The species occurs in the Unites States in Arizona, California, and Nevada. Records from New Mexico are not confirmed. Habitat and Ecology: Cylindropuntia bigelovii occurs abundantly in warm regions of the Mojave Desert, in the Sonoran Desert, and also in Baja California and in the Lower Colorado River Valleyon rocky slopes, sandy flats, gravelly to rocky washes, bajadas, hillsides in the Sonoran desert scrub and in the Lower Colorado River Valley. Cylindropuntia bigelovii also grows on sand dunes along the beach in coastal Atriplex dominated scrub, and further inland on flats and on rocky slopes (mostly volcanic rock) in desert scrub. Cylindropuntia bigelovii is a very widespread and extremely common species with no major threats. It is more likely to be treated as a pest plant in some places.These stems are often carried for some distance by sticking to the hair of animals. Often small "stands" of these chollas form that are largely clones of one individual. 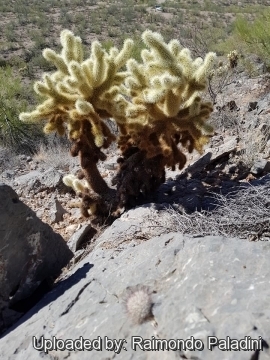 Like its cousin the jumping cholla (Cylindropuntia engelmannii), the stems detach easily,even by strong winds and the ground around a mature plant is often littered with scattered cholla balls and small plants starting where these balls have rooted. The spines are barbed, and hold on tightly. Desert pack rats such as the Desert Woodrat gather these balls around their burrows, creating a defence against predators. This covering of spines not only provides protection from herbivores like rabbits and rodents, it is also believed to protect the stems from intense sunlight and may be a cooling mechanism for the cactus. It can grow so dense that it can form impenetrable stands. Due to its vegetative reproductive method, in some forests all of the plants may be clones that grew from pieces of a single pioneer plant that was transported to the new area. 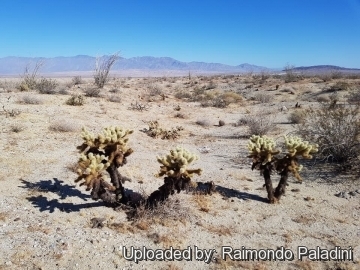 Description: The teddy-bear cholla (Cylindropuntia bigelovii) is a perennial, shrub or small erect tree, 0.30 to 1.50(-3) m tall with a distinct trunk. The branches are at the top of the trunk and are closely spaced and nearly horizontal. Lower branches typically fall off, die and fall off, giving the cactus a vertical appearance and the trunk darkens with age. The yellowish spines almost completely obscure the stem with a fuzzy-looking, but impenetrable, defence. The spines are 2.5 cm long and are covered with a detachable, paper-like sheath. Cylindropuntia bigelovii has a soft appearance due to its solid mass of very formidable spines that completely cover the stems, hence the common name Teddy Bear. Stem (trunk): Generally erect, solitary, usually less than 2 metres tall, main branches few, closely spaced, short, spreading, nearly horizontal, with older branches at base of crown, clinging becoming dark brown or black. Stem segments, terminal, cylindrical, succulent, easily detached from the plant, whorled or subwhorled, green to gray-green, 4-13(-18) cm long (generally less than 10 cm long), and (2-)4-5.5(-6) cm in diameter. Distal segments usually very easily detached (propagules). Tubercle , broadly oval, 4-8(-11) mm long, 3 mm high. Areoles: Elliptic-deltate, 5-6 mm long, 3-4 mm wide; wool white-yellow to brownish, ageing grey. Areoles also bear small, barbed, deciduous bristles sometimes called glochids, sometimes extending along areole margins, yellow, 3-4 mm long. Spines: (4-)8-10(-15), per areole, at most areoles, interlaced with spines of adjacent areoles, usually uniformly, diffusely spreading, very sharp and well barbed (10-)15-25(-28) mm long. Younger spines are yellowish or very pale yellow-brown, sheath uniformly whitish translucent or pale yellow to pale brown and turn black with age, which is easily observed by examining the base of a taller plant. Flowers: Yellow-green at the tips of the stems. Usually 3.6 cm in length. Inner perianth (15-)20-25(-40) mm long, yellow-green to whitish, sometimes tipped red, spatulate, yellow. Filaments green, anthers orange. Style light green; stigma lobes light to dark green. Fruits: The fruit is cylindrical to broadly obconical (15-)22-40 mm long, (8-)16-20(-28) mm in diameter, fleshy-leathery, yellow at maturity, not proliferating, tuberculate, and may or may not have spines or bristles. The fruits usually have no viable seed, as the plant usually reproduces from dropped stems. Umbilicus 8-10 mm deep. Areoles 36-64, evenly spaced. Seeds: 2.5-4 mm long, 2.2-3.5 mm across, pale yellow, in gelatinous mass, angular to squarish in outline, generally sterile. 3) Pinkava, D.J., Puente, R. & Baker, M. 2013. "Cylindropuntia bigelovii." The IUCN Red List of Threatened Species 2013: e.T152659A662601. http://dx.doi.org/10.2305/IUCN.UK.2013-1.RLTS.T152659A662601.en. Downloaded on 30 October 2017. 8) Hunt, D., Taylor, N. and Charles, G. (compilers and editors). 2006. "The New Cactus Lexicon." dh Books, Milborne Port, UK. 9) IUCN. 2013. IUCN Red List of Threatened Species (ver. 2013.1). Available at: http://www.iucnredlist.org. (Accessed: 29 Oct. 2017). 10) Paredes, R., Van Devender, T.R. and Felger, R.S. 2000. "Cactaceas de Sonora, Mexico: su diversidad, uso y conservacion". Arizona-Tucson Desert Museum Press, Tucson. 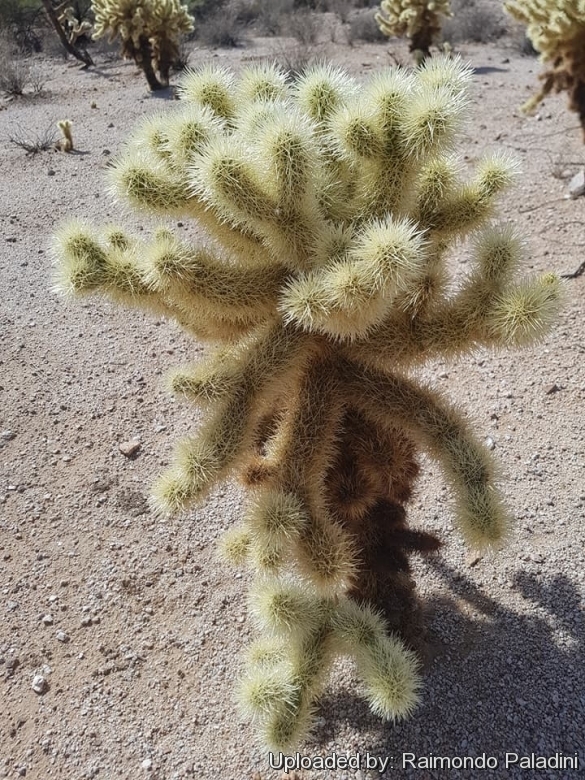 Cultivation and Propagation: When a piece of this cholla sticks to an unsuspecting person, a good method to remove the cactus is with a hair comb. But because the spines are so well barbed, be prepared to give a good tug. 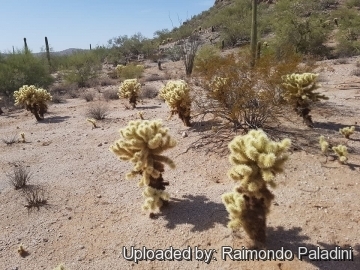 Many people might swear that the cactus jumped at them and grabbed them, which explains the common name Jumping Cholla. This is a testament to the efficiency of the barbed spines at attaching to passers-by. Traditional uses. In the past, "Cylindropuntia bigelovii." was used to be an important food source for the people of Isla Tiburon. The Seri Indians used to eat the tender stem. The species is widely cultivated.